Some experts have predicted that by 2020, 50% of all of our internet searches will be made by voice. In a world where smart homes, wearables, and voice-search-enabled digital assistants like Microsoft’s Cortana, Apple’s Siri, and Amazon’s Alexa and Echo are becoming the norm, companies need to listen to consumers—and to respond. That’s why more businesses have begun to harness the power of voice search. You can read about current techniques and other rising technology trends in our free white paper. In the meantime, we’d like to share one simple way to engage a more targeted audience via voice search. It requires no specific coding or back-end web development, but it can make a clear difference in your marketing efforts: Use a conversational tone and answer questions in your online content. 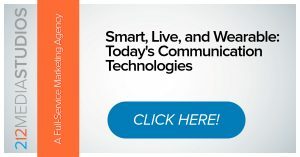 Read our white paper to get everything you need to know about communication trends in an evolving industry! While keywords are still important in SEO, users are now searching for results that answer casual or spoken questions. When performing voice versus text searches, consumers change their behavior. Typed searches tend to use as few words as possible (e.g. “best comfort food Chicago”). When searching by voice, however, people tend to use more words. They form a question starting with “who,” “what,” “when,” “where,” “how,” or “why” (e.g. “What is the best comfort food restaurant in Chicago?” or “Which comfort food restaurants are open for dinner now?”). The type of “question word” is useful in providing more context about user intent, as well as exactly how far along in the purchase process consumers are (i.e. whether they are ready to purchase or doing initial research). For instance, users who ask “What are the differences between cross trainers and running shoes?” are probably just researching. However, if they ask, “How much is a good pair of cross trainers?” or “Where can I buy New Balance running shoes?” they are much closer to actually hitting the pavement. Refine your content so that it matches the user’s level of intent. Because of the Internet of Things and artificial intelligence, technology can now better understand who we are, where we are, and what we’re doing. Since it is predictive in nature, voice search has the ability to understand consumer intent and anticipate what a potential customer’s upcoming needs might be. As a result, your company is better positioned to use the context of each question-based query to help search engines deliver the most relevant results.